It might not sound romantic, but Original Travel’s unique “Dump and Run” service* is exactly what frazzled parents need to get away from family life and rekindle their relationship. Parents who book a break through Original Travel and choose to use the service have two options: Leave the children with trusty grandparents, in which case Original Travel will organise for a thank you food hamper to be hand-delivered; or enjoy a 10% discount on the new emergency and temporary Nanny service by Greycoats Lumleys, the childcare experts who can provide a highly qualified and vetted last-minute nanny. Each child will also receive a fun pack from children’s party planners extraordinaire, Sharky and George, tailored according to age and interests. With childcare sorted, the world is your oyster. Here are just some of Original Travel’s most romantic breaks and for a full collection, click here: www.originaltravel.co.uk/collections/romance – and don’t forget to take advantage Original Travel’s on-the-ground concierges whilst away. They can organise reservations at the most sought-after romantic restaurants and have unrivalled local knowledge, from where to enjoy the best sunsets to where to find the best couples massages, turning the hopeless into hopeless romantics! With Valentine’s Day falling on a Thursday this year, it’s the perfect opportunity for a long weekend away and New York is a surprisingly romantic city. Snuggle up on a carriage ride in Central Park, go jewellery-shopping in Tiffany’s, channel an Affair To Remember with a trip to the top of the Empire State Building or just enjoy lots of cosy dinners and cocktails. Original Travel (originaltravel.co.uk/ 020 3582 4990) offers a four-day city break to New York starting from £700 per person based on two sharing (obviously!) and includedirect flights with British Airways and a three-night stay at the Viceroy Central Park New York in a Deluxe Room. Spend a week cruising through the Champagne region of France aboard the new Belmond barge, before a stay in the also newly opened Royal Champagne Hotel while enjoying (you guessed it) lots of France’s best champagne. With a recurring theme, enjoy a backstage at Bollinger private tour, plenty of private vineyard tours and tastings, and you can even learn how to make your own champagne before, in case you somehow happen to be thirsty, enjoying some more champagne in a treehouse bar. Original Travel (originaltravel.co.uk/ 020 3582 4990) offers a one-week trip to Champagne staying one the Belmond Pivione and at the Royal Champagne Hotel starting from £7,375 per person. Price includes all the experiences above, accommodation, flights and transfers. It doesn’t get much more romantic than snuggling up with your other half in a four-poster bed, raised up on a treehouse platform in the middle of the South African bush. Following on from an afternoon game drive in the Sabi Sands Game Reserve, arrive at your secluded lantern-lit treehouse as dusk falls to find a gourmet dinner and chilled sundowner waiting for you before a night of stargazing from your bed. Back on the ground, it’s time for some beach paradise. Head to Mozambique for a luxurious private island stay spending time doing very little, and loving every second. Original Travel (originaltravel.co.uk/ 020 3582 4990) offers a two-week romantic trip to South Africa and Mozambique starting from £8,720 per person. Price includes accommodation in Cape Town, Sabi Sands sleeping in a luxurious treehouse, and Azura Benguerra; transfers and all flights. Sweep your other half off their feet with a two-week holiday to Bali and surprise them with numerous once-in-a-lifetime romantic experiences that we can organise on your behalf. Enjoy dining-for-two experiences including a private picnic overlooking Tanah Lot, an intimate private dinner lit by 100 candles and sunset cocktails and canapes aplenty. If you’re feeling spiritual (how can you not while in a tropical paradise) enjoy sunrise meditation on the beach and a blessing by a Balinese priest before indulging in a massage under the stars. Original Travel (originaltravel.co.uk/ 020 3582 4990) offers this two-week trip to Bali starting from £3,400 per person. Price includes accommodation, flight and transfers. 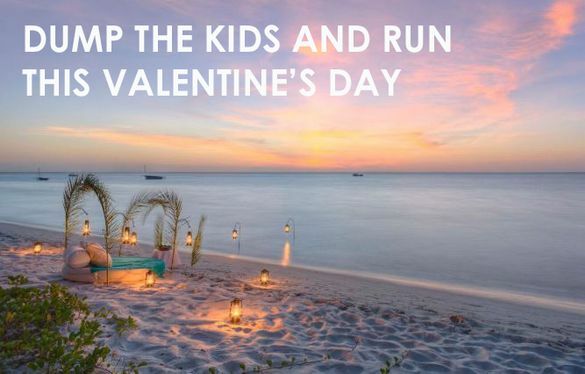 *Credit for the phrase goes to an Original Travel client and harassed Mother who phoned in with a plea for a break where she could “Dump the kids and Run”, and so the service was borne. Original Travel is one of the UK’s fastest growing bespoke travel companies, offering tailor-made holidays to 77 countries worldwide. Since its launch in 2003, the multi-award winning company has firmly established itself as ‘one to watch’ in the travel industry, experiencing uninterrupted growth since 2003. The Original Travel team have created just over 50,000 itineraries for their extremely discerning clientele. Unlike many companies in the sector, Original Travel also has a bespoke inbound division welcoming clients from all over the world to the UK, and its own specialist dive division – Original Diving – staffed by dive masters and marine biologists who pride themselves on their unparalleled dive expertise and knowledge of the best dive destinations across the globe.